Dark elbows and knees subtract the beauty from your everyday fashion style. 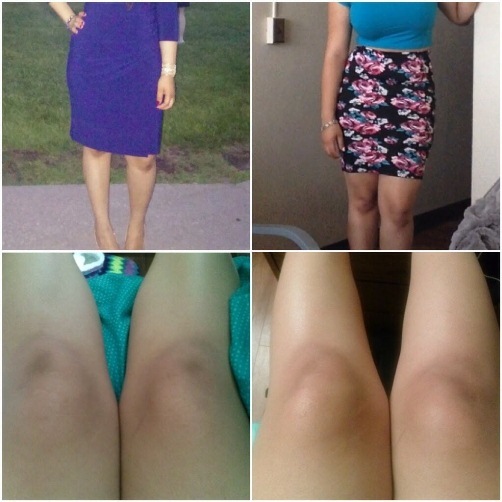 This is probably a most common problem in women that they become embarrassed for wearing short sleeve dresses and short skirts due to which the elbows and knees are showed off. So they prefer to wear the dresses through which they can hide the elbows and knees in a good way. Actually the areas of elbows and knees do not possess oil glands that are why the skin of those areas is thicker as compare to the surrounding skin and thus why it is very dry in texture. There must have some care of those areas otherwise the skin of those areas will become darker day by day and at last you will not be able to do anything. There are some major reasons because of which the areas become darker such as continues rubbing, greater exposure to the sun, inheritance, dry skin, hormonal imbalance, obesity, dead skin cells and excess amount of melanin pigment. Here are few of the natural home remedies have been introduced to get rid of that darker elbows and knees without any side effects. Coconut oil remedy is best to lighten up the dark knees and elbows because it contains vitamin E which is responsible for this purpose. Along with that, coconut oil works to keep your skin hydrated and moisturized. After every shower, apply coconut oil on your knees and elbows then massage for about 2 minutes. Repeat the procedure several times a day to prevent your skin from dryness. Alternatively, you can prepare a mixture of 1 tsp of coconut oil and ½ tsp of lemon juice then rub this solution on the darker areas and set aside for 20 minutes. Follow this remedy at least once in a day. Another option we’ve got for you that add some amount of coconut oil to 1 tbsp of walnut powder to form a thick paste. Use it on the darker areas of knees and elbows 3 times a week. Lemon is amazing for this purpose because it a natural bleaching treatment through which you can easily get rid of this problem very soon. It can be used as an exfoliating agent along with the contents of vitamin C which helps in removing the dead skin cells and turn it into the lighter skin tone. Apply lemon juice on your elbows and knees then massage for a few minutes with the help of gentle motion of your hands. Leave this for about 20 minutes then wash it off with warm water. At last, apply a good moisturizing lotion. You also have an option to extract the juice of lemon and mix it with 1 tbsp of honey. Apply this mixture on to the targeted areas of knees and elbows then leave it for about 30 minutes. After that, wash it off with lukewarm water. Yogurt has lactic acid present in it that is why it helps in making the skin tone lighter in color. It also helps in cleansing and moisturizing the skin. Take 1 tsp of plain yogurt and 1 tsp of white vinegar then mix them together so a smooth paste will form. Otherwise, there is another way that you can take 2 tbsp of gram flour and 1 tbsp of plain yogurt then mix them together to make a thick paste. Apply this paste on the dark areas of elbows and knees then leave it for 20 minutes. Rinse out with water. You can make a homemade sugar scrub with your own. It is also a fine remedy for reducing the darkness from your elbows and knees. Sugar granules actually work as to exfoliate the dead skin cells and make it soft. Take equal amounts of sugar and olive oil then make a thick paste by mixing both of them. Apply directly this paste on your knees and elbows then rub your skin with the help of circular motion of your hands for about 10 minutes. Wash it off using a mild soap and warm water. Do this remedy for at least once in a day. Baking soda is also used because it is a great cleanser for reducing the darkness from elbows and knees. It also reduces the hyper-pigmentation from these areas. Take 1 tbsp of each of the milk and baking soda. Prepare a paste by mixing them together. Apply this on the affected areas then rub with the help of gentle hands for 3 minutes. Wash it off with lukewarm water then take a towel and pat dry the areas. Repeat the procedure on every other day until you see the desired results. Aloe vera is the most suitable ingredient for such types of problems because it is reliable in treating this problem and thus it keeps the skin hydrated and moisturized all the time. If you do not have even skin tone then you can use aloe vera. Take an aloe vera leaf and extract the aloe vera gel from it. Apply this gel directly to the affected areas. Sat aside for 20 minutes then wash it off with warm water. Repeat the remedy 2 times daily for several weeks. Almond or you can also use almond oil as these both are best for your skin. Almond has rich amount of nourishing properties that help in making your skin tone even and keep it glowing and beautiful ever. Take some almond oil in a pan and warm it slightly. Now apply directly on the affected parts for 5 minutes before going to bed. Otherwise, mix 2 tbsp of powdered almonds in little amount of yogurt to make a thick paste. Now apply this on the elbows and knees. After some time, wet your fingers then rub the areas with gentle motion of your hands and when it gets dry, wash it with cold water. Do this remedy for twice a week. Mint has some kind of unstable oils that help in generating the collagen in the body. It works as keeping your skin healthy and even skin tone. Take handful of mint leaves and boil them with ½ cup of water for about 3 minutes. Now also add ½ of lemon juice in it, strain it finely then allow it too cool down completely. Take a cotton ball and soak in this solution then rub this onto your knees and elbows. Leave it for about 20 minutes then wash it with warm water. Follow this remedy 2 times daily. Turmeric is also good for treating the dark elbows and knees. It helps in maintaining your skin and adds a beauty and glow on your skin. Take some quantity of turmeric powder and mix it with 1 tsp of milk cream. Apply this paste on your knees and elbows then massage for a few minutes. Alternatively, take equal amounts of turmeric powder and gram flour. Now mix them together and add a little amount of rose water. Massage your knees and elbows with this paste; it can be work as a good scrubbing cream. Leave it for 15 minutes then scrub it off when it dries. Cucumber has a bleaching quality and it gives an even skin tone to your knees and elbows. It also makes your skin moisturized and pure from dead skin cells. Cut the cucumber into thick slices and gently rub your elbows and knees with these slices for 10 minutes. Leave it for 5 minutes then wash off with cold water. Another option that you can do is mix lemon and cucumber juice. Now add some turmeric powder then apply this mixture on the affected areas then leave it for 30 minutes. Wash it off with water and do this remedy regularly. Before going to bed, do not forget to massage your knees and elbows with shea butter or cocoa butter. Before taking a bath, massage the elbows and knees with thick slices of potato for approximately 5 minutes. Take a small slice of ripe papaya and rub it onto the skin and see the result. 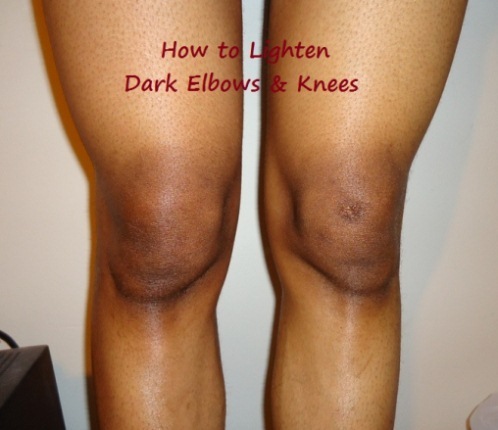 Do not pressure your elbows and knees to any surface because it can tend to become darker and rough also. Protect the areas from ultraviolet lights of the sun so always wear sunscreen when going into the sunlight. With a pumice stone or scrubber, scrub your skin regularly for few minutes. In case if you have open wounds, do not exfoliate the knees and elbows because it can be harmful and risk of infection. To avoid dryness, apply moisturizer regularly on your skin. At the high temperature, always try to wear full-length long-sleeved clothes. Try to increase the amount of vitamins and minerals in your diet for good skin nourishment. Drink 10 glasses of water every day to make your skin healthy and hydrated.